After a couple years of doing the projection I've noticed that using a white sheet doesn't always work best in all conditions. For example, when it's still daylight out you will lose some of the contrast in the areas of the animation that should appear black. Since the sheet is white it will reflect some of the light coming in from outside the window. 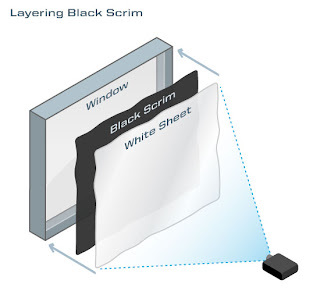 I tried hanging a black scrim material (basically a mesh) between the window and the white sheet to help darken the black areas. Since my projector is pretty bright it worked really well. Have a look at the video below to see the effect. Update: My BenQ projector has a brightness of 2200 lumens. During dusk lighting conditions it improved the contrast quite a bit. Once it was dark out it didn't really change things much... in fact it brought the brightness down on the projection a tiny bit but it wasn't all that noticeable. 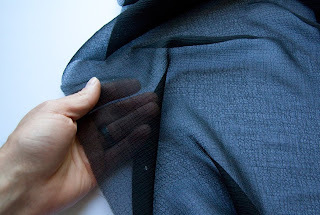 Update: Here's a picture of the black scrim material I used. I have no idea what it's called... I just picked out something from the fabric store that looked like it would work. For the first 2 years of displaying Hallowindow I borrowed a Canon projector to use. I'm not sure what model it was but it did a great job. I'm pretty sure it was a mid range model meant for office use and not necessarily home theater. Last year, the friend that I borrowed it from wanted to do his own projection of Hallowindow so I decided to pick up my own. I did a little research online before deciding to buy the BenQ MP622c... actually 2 of them. 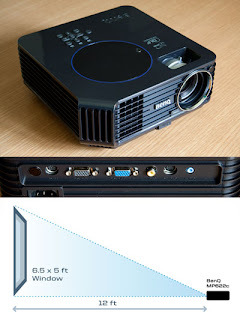 It's a decent lower end projector that works good enough for projecting into windows and on walls. It actually turned out to be brighter than the Canon but I found that the lens didn't throw the image out at a wide enough angle. Meaning I had to have the projector sitting pretty far away from the wall in order to get the image to be large enough to fill up my window. So if you have to set up a projection in a small room this may not be the idea projector for you. It ended up being OK for me... see my diagram below for the distance to size ratio. The lens specs from the manual are F=2.4 to 2.48, f= 20.7 to 22.8mm. I assume that the shorter the focal length (mm), the wider the angle would be. I just thought I'd post the Hallowindow 2007 video here for reference. I still really like the lightening scene in this one. I think I'll be making a full lightening storm loop in a future release. I just set up this blog. 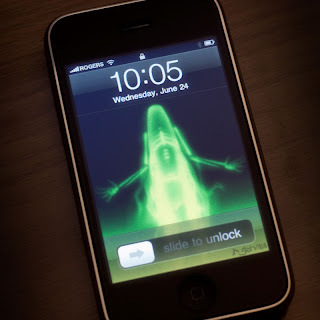 Check back later for more posts.